I’ll start by saying that I am not generally part of the Facebook police. I figure the medium just lends itself to the spreading of misinformation, and I have a limited amount of time and energy to keep people honest. I rarely pursue all the photos and factoids posted by friends. But, for some reason, the photo of a little girl curled up asleep in the outline of a female figure with the caption indicating she was an Iraqi orphan longing for her mother seemed too heart wrenching to be true. It didn’t take me long to discover that the photo had, indeed, been staged by a professional photographer. The little girl is Iranian and a relative of the photographer who, on her flickr page, has similar photos. I know that in this day and age of the Internet, and especially since I’ve been on the Internet for 22 years now, I should know not to take things at face value. But it grabbed me and then I felt betrayed that it was staged, but presented as photo journalism. As Annie points out, there are plenty of sad stories of children in war zones. Why make up a story? Maybe because you can? And perhaps the original poster figured it would highlight a tragedy so its verity was not important. But, a quick look at the poster’s public Facebook profile shows a wide variety of posts from silly cats to find the panda so I’m not sure we can give him the benefit of the doubt. I would like to extend that benefit to my friend who shared it…she is a socially conscious individual who really does care about the world. But, she is also a well-educated woman who should know better. I suspect if I called her on it, she would be apologetic but might also lean towards the side of bringing attention to children in war and be less concerned about what I see as a major digital citizenship problem. If you aren’t willing to check your sources before you post, what other questionable bits of information might you be passing along? Maybe nobody gets hurt…well, except for the photographer whose photo is under standard copyright and the next person who shares it only to find out it’s fake and, honestly, my friend whose reputation is now suspect at least in my mind. These are certainly minor hurts in a larger world of hurting children but scaled up they lead to the kinds of misinformation that make the web the dangerous echo chamber it has become. I used my some of my time over the break to reconnect with The Daily Create. 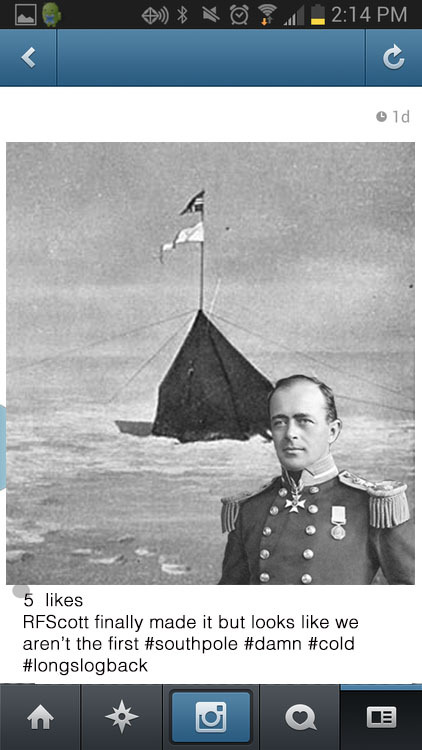 I wrote a few poems, posted some photos and found myself somewhat obsessed with Robert Falcon Scott, the tragic Antarctic explorer. Maybe it’s the Polar Vortex. In response to the New Year’s Day assignment, I wrote Scott’s new year’s resolution for January 1912, which was to reach the South Pole first and claim glory for England. He and his team were already on their way to the South Pole, unaware that Roald Amundsen had beaten them by nearly a month. The tent in the back is the one left by Amundsen.